As the winter mist slowly lifts, rays of sunshine fall on ice-crystal-covered trees, transforming the garden into a dazzling still life. Hoar frost is a rare occurrence and can only form with a relative humidity of over 90 percent combined with a temperature some degrees below zero. In these conditions, small droplets of moisture are turned into the frost flowers that spread across the window panes of garden sheds. 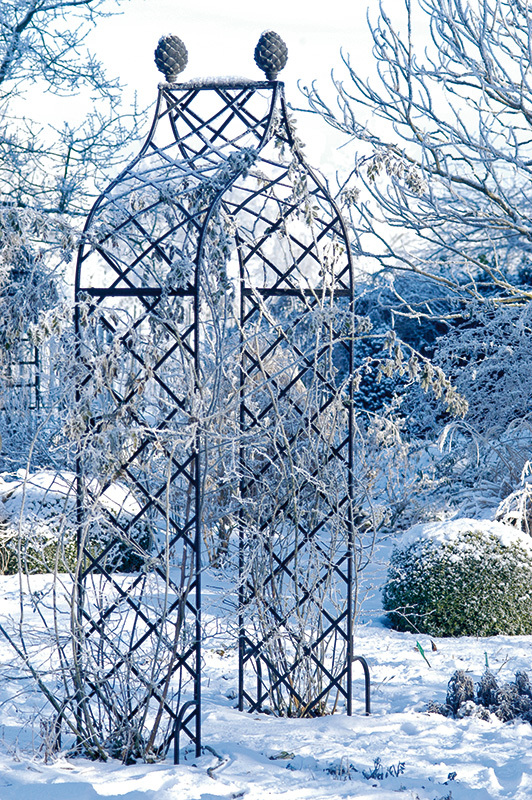 A stroll in the quiet of winter will reveal how completely a garden designer has mastered his craft. 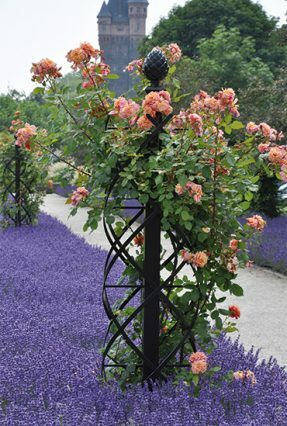 The cold months expose the structure of a garden, its space now clearly defined by hedges high or low, by a solitary tree or shrub, perhaps an evergreen buxus globe, and by well-chosen plant support structures. 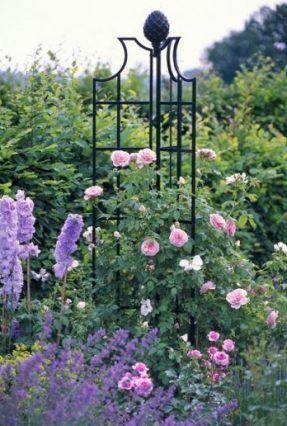 Free-standing trellises, obelisks and rose arches, which in summer play a supporting role behind a profusion of colourful climbing plants, now take centre stage during the cold season. What a delightful metamorphosis that winter and frost bring about! 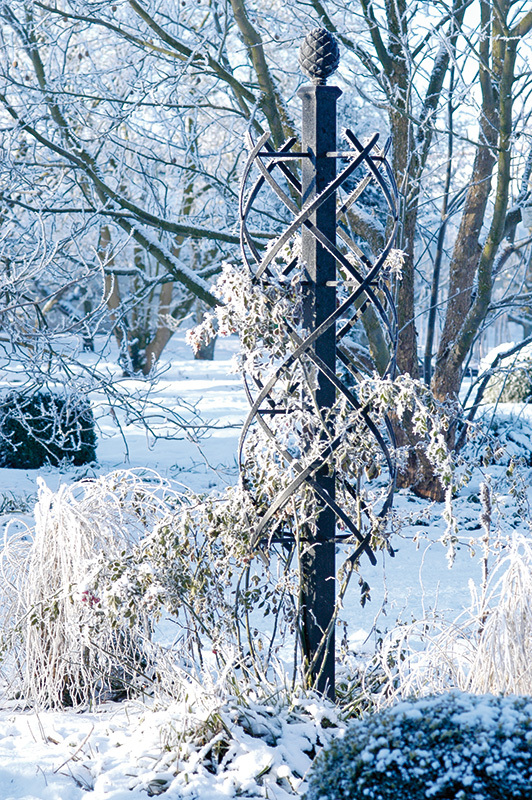 In the botanical gardens in Steinfurt, Westphalia, Klaus Krohme has captured the magic of nature on camera as the white ice has melted away from the Kiftsgate and Brighton Rose Arches and the Charleston Rose Pillar. 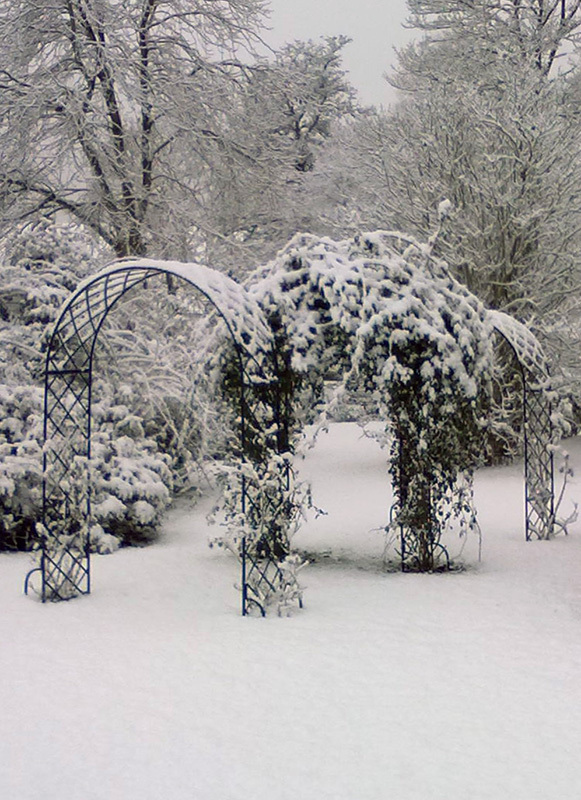 Fresh snow has fallen overnight and the garden lies beneath a carpet of spotless white – a moment of breath-taking magic and at once a practical gift. Whereas black frost can cause the soil to freeze to quite a depth, a coat of snow provides insulation, protecting plants against the extreme cold. At the same time, nobody should underestimate the weight of a layer of snow. Evergreen plants such as rhododendron, boxwood or cherry laurel can easily suffer under the load of wet snow, and their branches can easily break. After heavy snow, it will pay to shake it off either by hand or with the help of a broom before it turns to ice. 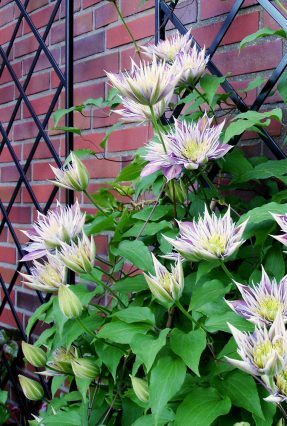 By contrast, a robust, iron plant support will not require any special attention during the winter period. 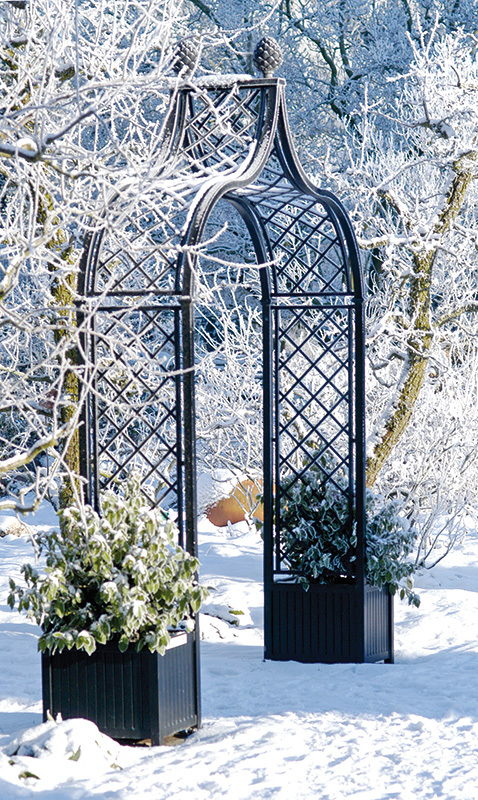 While a park or garden slumbers, black support structures – such as Obelisk I or the Bagatelle Rose Arch – appear enchanting under their white covering. 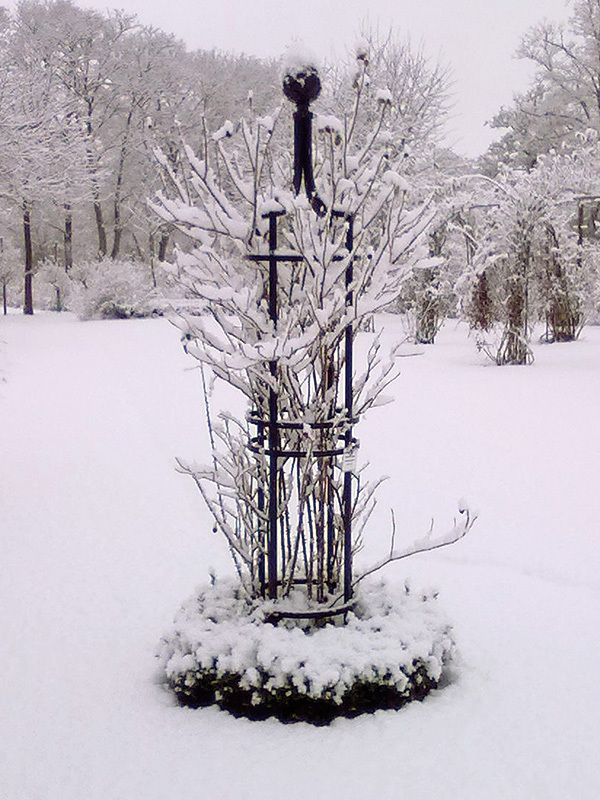 The photos taken by Leif to Baben in the snow-covered Glücksburg Rose Garden perfectly catch this moment of transitory beauty.